The way businesses run and how people work has changed dramatically with the introduction of the internet. Simply being able to send an e-mail or a ZIP file filled with assets changed the pace of projects getting completed. 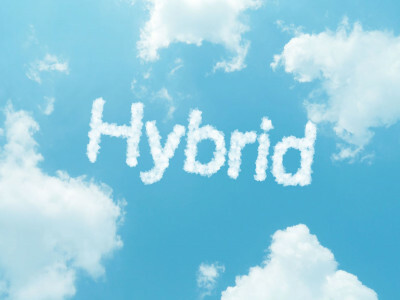 With the introduction of the cloud, businesses in various sectors have taken the next step in upping the pace and productivity of their teams with hybrid cloud adoption. All areas of operation in businesses of all levels can benefit from the implementation of a dynamic environment. These hybrid cloud systems can help optimize existing infrastructure, balance cloud solutions of various types, meet and adjust to growth opportunities, assess and mitigate risk, and manage data resources. All of this is scalable and customised to meet the specific needs of your organization. Staying competitive in any sector requires consistent, effective operations. A customized hybrid cloud provides a common identity, integrated management and security, a consistent data platform, and unified development. These ensure that all stakeholders are coordinated and seamlessly engaged across all assets. Part of the common identity piece is using single sign-on, which allows uses to provide on-premises or cloud access while protecting business assets. Admins can manage accessibility by user, restricting them to only areas they need. They’ll be able to easily change or update those permissions as well. It’s important to evaluate your requirements in these areas and work with a good systems integrator to ensure your customized system is tailored to those needs. Regardless of whether a user signs into your system on-premises or in the cloud, having full access to data and analytics is a must. Your remote team will have full visibility to the same information as those in the office. With single sign-on, administrators can also monitor user activity to help mitigate risks. Threats are intrinsic to any business, but with protection and recovery processes and security tools, a hybrid cloud environment offers complete visibility and control. 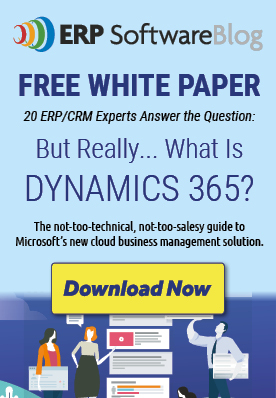 In fact, according to Microsoft’s Accelerate Your Digital Transformation guide, 59 percent of IT professionals believe their data environment is safer after adopting cloud services. It costs time and money to develop applications across several different environments. It may even require different teams with different development knowledge; one coding for the public cloud, while the other is programming that same application for the on-premises system. Working from a hybrid environment means there’s a straightforward link between assets in two different areas and allows developers to easily and efficiently develop and update them both. An important step in the digital transformation of your business is selecting the hybrid cloud solution that works best for you. Contact AKA Enterprise Solutions today to discuss their Ground to Cloud Essentials services and learn more about how they can make a hybrid cloud environment customized to your business. 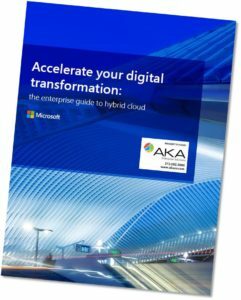 Download this Microsoft Whitepaper, Accelerate your digital transformation: the enterprise guide to hybrid cloud, to learn more about the benefits of a hybrid cloud solution.